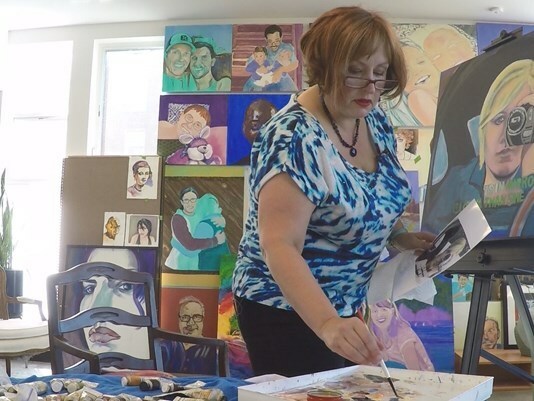 Artist Melinda Hannah finalizing portraits of LGBT Mormons. Photo courtesy of Melinda Hannah. "You can be gay, or you can be Mormon. But you can't be both." I grew up hearing that a lot as a gay Mormon kid in Idaho. I guess in some ways it was no surprise to hear that from my Mormon friends, family and leadership since by and large, most of them didn't understand what it actually meant to be LGBT. But as I grew up, I heard it from some of my friends in the LGBT community as well -- and for a time, I actually allowed myself to believe it. It was a painful place to be. I felt tossed back and forth between two communities, neither of them wanting to claim me as a whole, integrated person. One the one hand, I had no choice over whether or not I was gay -- I'm a firm believer I was this way before I came to this life and I'll be this way when I get to the next. And on the other, being Mormon is much more complicated than just an activity I practiced for a few hours on Sunday; it is a culture deeply steeped into my identity, and it's not something I could turn my back on without leaving behind a core part of who I am (not to mention my family, friends, and faith practice). My world was full of people who weren't shy about telling me how to live my life -- and on any given day, I couldn't be Mormon enough for my Latter-day Saint family and friends, and I couldn't be gay enough for my LGBT community. I felt like a man with a foot in two worlds, but I didn't fully belong in either. No matter which one I chose, I still lost part of myself. But today that's different. Today, when someone tells me, "You can't be both gay and Mormon," I gently reply, "Watch me. I do it every day." Today, there are thousands -- perhaps tens of thousands -- of LGBT Mormons like me throughout the world, and we claim both our religious roots and our orientation without apology. We don't view ourselves as "broken and suffering," the way many inside Mormonism see us. Instead, we have come to realize that the only thing "broken" about us is the way we were taught to understand ourselves in relation to God and our fellow humans; and any "suffering" we have experienced has come largely at the hands of our brothers and sisters inside the Mormon church -- including our leadership. Health, wholeness, and happiness for us comes not from choosing one side of ourselves at the expense of the other -- but instead, from integrating them and forging our path through life as LGBT Mormons. And while it may once have felt like we were people with a foot in two worlds that didn't seem to intersect, we've come to understand that those two worlds do indeed intersect -- and that we are that intersection point. An art show opening in Provo, Utah later this month features portraits of some of these LGBT Mormons -- many of them alongside their partners and spouses of the same gender. The show runs from September 22-25 with a special reception on Friday, September 23 at 5:30 P.M., at Writ and Vision Rare Books and Fine Art in downtown Provo. The exhibit is officially named "The Hero's Journey of the LGBT Mormon," after the book by prominent Latter-day Saint author and LGBT ally Carol Lynn Pearson. The exhibit coincides with the annual conference of Affirmation, an organization run by and for LGBT Mormons. Melinda Hannah is the artist and brainchild behind the event. "I've long held that art can be a unique and powerful way to capture the beauty that is found inside authenticity, and the LGBT Mormons I've had the honor to work with in this show have a genuine spirit of authenticity and wholeness that I wanted to bring to life--and bring to others," said Hannah, who is based in Seattle. Hannah has prior experience with communities who've suffered trauma yet emerged whole and healthy. Her art show in 2014 focused on women survivors of cancer and it's her passion for 'healing through art' that inspired her again here. In November of last year, the Church of Jesus Christ of Latter-day Saints enacted a worldwide policy that mandates church discipline (the process that leads to excommunication) for LGBT Mormons who choose to live authentic lives and marry someone of their same gender and bars children with LGBT parents from being baptized into the faith until those children turn 18 -- and only then if they openly disavow the relationship of their parents. "When the November policy was announced in church, I sat with a gay Mormon friend of mine for several hours one Sunday. I saw her pain, her fear, and I held her as she cried. I recognized that there is healing to be done here -- and I feel called to help," added Hannah. She continued: "Not every LGBT Mormon is in the same place spiritually and emotionally as the ones depicted in the show -- it is my hope that their portraits will inspire others to begin to view themselves as whole and loved by God. Even if the Mormon Church itself is unable to welcome and love its LGBT members right now, I have a firm testimony that God certainly does. He always has." The LGBT Mormons featured in the show agree with Hannah. A few of my fellow LGBT Latter-day Saints featured in the exhibit shared their thoughts with me here. "I have always believed that there could be a place for everyone in the Mormon Church, and that happiness and love could be a real part for everyone in this life, too. As a lesbian Mormon, I felt called to boldly be in the pews; to be tolerant while creating tolerance, and hold space to help stop so much unnecessary grief and pain. Like many that held this space before me and those that will follow, I feel a deep honor that I have had a chance to run my lap; to carry the baton for the team and pass it to the next gay Mormon advocate, until I am called to run another leg for change." "I'm gay and very proud of it. I suspect I'm the first gay rights activist to join the Church of Jesus Christ of Latter-day Saints after the November policy. I was baptized Dec. 5, 2015. I'm reclaiming the place I had in our pre-mortal family council, where all of God's LGBT children had an honored place. If we LGBTs didn't have an honorable place, we wouldn't have a body right now. We were loved and nurtured before the world began. My Heavenly Father manages this universe. He would not send me here only to forget about me. God is arranging all things gloriously for his LGBT children. We only have to watch it unfold." "Mormonism is my home -- it is my religion and the religion of my family--and through it I have developed a firm testimony of the Gospel of Christ. It is through Christ's Gospel that I found the courage to come out, to be honest about who I am as a gay man. A tenet of living the Gospel of Christ is living an authentic life. And because I am now living an authentic life as a follower of Christ, I have an abundance of peace and joy that I never had while I was denying my orientation. For me, living my truth is part of living the gospel--I cannot be a true follower of my Savior and be dishonest about who I am." Each of the LGBT Mormons in the art show have written similar statements about their journey as LGBT Mormons, and you can learn more about the show on the Facebook event page. I'm proud to walk with my LGBT Mormon brothers and sisters on this journey -- as some have called it, a Hero's Journey. And as we continue our journey, we welcome our Latter-day Saint fellows to walk by our side -- gay, straight, and everywhere in between. For those who cannot yet do so, we will hold a space for you. But we will no longer believe that we are broken, suffering, or unworthy of Christ's love and full inclusion. When you are ready, we will take your hand as equals in our family of humanity, and together we will build a better Zion.